Julie and I have been serving with TEAM in Taiwan since 1995. We were both raised as missionary kids in Taiwan, and after starting to date in high school while attending Morrison Academy in Taiwan, we got married while studying at Moody Bible Institute. I finished my formal education at Trinity Evangelical Divinity School with an MA in Counseling Psychology in 1988. Our son Mark was born a few weeks later, and our daughter Teri in 1990. Being aware of and burdened for the great need for cross-cultural missions, we prayerfully considered how God might want to use us. While preparing to return to Taiwan for ministry, I enjoyed working as a youth and family counselor and with substance abuse clients. 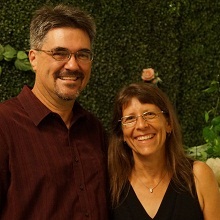 Mark and Teri are now young adults who have graduated from college and are living and working in the United States. Ron and I have been missionaries in Taiwan since 1995. But, our relationship with Taiwan did not start then. Both of us grew up in Taiwan, children of missionaries. I serve primarily as the Director of Trailblazer Camps, a camping ministry in central Taiwan. TEAM has owned this facility since 1953, but it was originally a Bible school. In 1967 the decision was made to convert the facility into a camp. Since that time, the camp has served the Taiwanese church and foreign missionaries by providing a good location for camp and conference programs. In the mid-1990s, TEAM missionaries developed a new vision for the camp ministry. We now employ full-time national staff and continue to develop our own camp and training programs for children and youth. Trailblazer Camps is focused on helping the Taiwan church evangelize, disciple and train young people in order to strengthen the church, broaden its vision and provide leaders for the future. I have been working with missionary kids and international kids at Morrison Academy since 2000. I am a high school guidance counselor at this International School. I also teach Sophmore and Senior Bible classes. And best of all, I get to coach basketball and track and field. I often say that I have the best job in the world. High school kids are the greatest group of people to work with and cross culture high kids are even more amazing. While kids with cross culture experience have lots of great qualities, their highly mobile and highly cultural lives also create some challenges. Through Bible classes, retreats, and personal relationships I hope to help cross culture kids and third culture kids survive and thrive.